Most recipes that either require or provide a fluid other than crude oil is produced here. The chemical plant has 2 inputs and 2 outputs in fixed positions. Solid items can be both inserted and removed by inserters from any point (no need to target fluid input/output connections). Crafting speed decreased from 1.25 to 1.0. 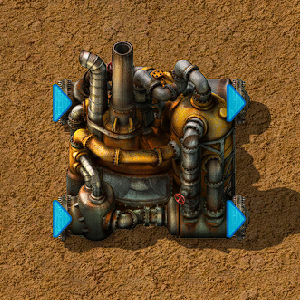 Oil refinery and chemical plant are now disconnected from pipes when the recipe is reset. Unused pipe connections don't connect to pipes. Fluid input amount is limited to 2x recipe cost. Fluid inputs for the chemical plant are now saved properly. This page was last edited on 30 March 2019, at 12:50.